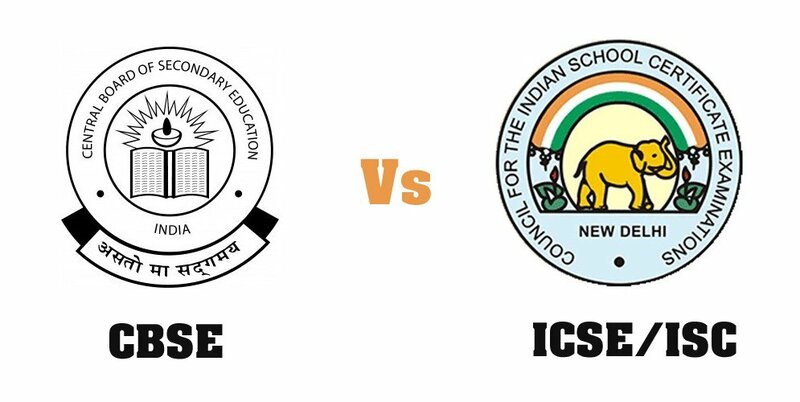 cbse vs icse- full difference between the different boards you can opt for. The CBSE ( Central board of secondary education) and ICSE ( Indian certificate of secondary education) board have always been an important choice for the Indian parents. There’s always a confusion that which board is better and which board to opt from. Both boards have some different patterns syllabus and idea to teach students. One should always try to analyse which one is better for the child Because each child is different and has different aptitude level and aspiration. The education system of India has been divided into four groups lower primary, upper primary, High, higher secondary. Well, the education of India more indulges for good marks/grades, despite getting good knowledge, understanding the basics or thinking out of the box. Education is just restricted to the textbook or guides which is overly limited for 24hrs. Now here are some serious facts about the two Different important boards of India in which the major number of students study. Both boards are unique in curriculum, abilities, functionality and standards. ICSE conducted for the students of 10th grade and ISC ( Indian school certificate) for the 12th-grade student. CBSE conducts two Main examinations All India secondary school examination ( AISSE) in 10th grade and All India senior school certificate examination ( AISSCE) in 12th grade. This is the most popular board you’ll find CBSE schools easily and it’s recommended to those who have transferable jobs. CBSE has both medium English and Hindi and has both types of students regular and private. CBSE is more towards science and mathematics. The syllabus is more suitable for the high-level entrance examinations like IIT-JEE, AIPMT and other competitive exams, these exams follow CBSE pattern. Students who want to make a career in medical or engineering should go for CBSE schools. The NCERT books which CBSE prescribes is the best for any competitive exams in India. The best thing about ICSE is, it’s emphasis on child’s all overgrowth in all activity around and has the balanced syllabus. ICSE aims to give practical knowledge more and improves the analytical skills of the students. The syllabus of ICSE is vast and gives equal importance to all subjects. ICSE gives detailed about every subject with an edge to English. They give pressure more on English and teach every subject in English. ICSE helps more to the students planned to opt management or co-operate related streams. CISCE is recognised by many foreign institutions. ICSE students perform better in scholarship examination as the syllabus is more based on world education standards. When we compare both the boards both boards are important and their education is also admirable. Both boards provide High-class education. Both boards are recognised by Indian college and university. The subjects are taught is equally similar in both boards, just the pattern is different. Now here is the full difference between the different boards, you can opt according to your child’s preference Because both boards will lead him as a different individual with different environment and will help in the overall growth of the child.